I hate to admit it, but our dear comet is fading. Only a little though. As Comet Q2 Lovejoy wends its way from Earth toward perihelion and beyond, it will slowly dim and diminish. With an orbital period of approximately 8,000 years it has a long journey ahead. Down here on Earth, we continue to look up every clear night hoping for yet another look at what’s been a wonderful comet. Despite its inevitable departure I encourage you to continue following Comet Lovejoy. It’s not often a comet vaults to naked eye brightness, and this one should remain visible without optical aid through mid-February. Like a human celebrity, Lovejoy’s been the focus of attention from beginners and professionals alike using everything from cheap cellphone cameras to high-end telescopes to capture its magic. Who can get enough of that wildly fluctuating ion tail and greeny-blue coma? The comet continues moving northward all winter long, sliding through the diminutive constellations Aries and Triangulum, across Andromeda and into Cassiopeia, fading as she goes. You can use the map above and binoculars to help you follow it. I like to create lines and triangles using bright stars and deep sky objects to direct me to the comet. Tonight for instance, Lovejoy one fist held at arm’s length due west of the Pleiades. On the 29th, it’s on a line from Beta Persei (Algol) to Beta Trianguli. On February 3rd, it pulls right up alongside the colorful double star Gamma Andromedae, also called Almach, and on the 8th forms one of the apexes of an equilateral triangle with the two Betas. You get the idea. The waxing moon will interfere with viewing beginning next weekend and render the comet nil with the naked eye, you’ll still be able to track it in binoculars during that time. Dark skies return around Feb. 7. Lost sleep at night, fingers tapping on the keyboard by day. Darn comets are keeping me busy! But of course that’s a good problem. Comet 15P/Finlay, which had been languishing in the western sky at dusk at magnitude +10, has suddenly come to life … for a second time. Two nights ago, Australian comet observer Michael Mattiazzo took a routine picture of Finlay and discovered it at magnitude +8. Today it’s a magnitude brighter and now joins Comet Lovejoy as the second binocular comet of 2015. Comet-wise, we’ve gone from zero to 60 and the new year’s fewer than 3 weeks old! Comet Finlay’s threw its first tantrum last December when it reached binocular visibility (faintly) shortly before Christmas. Discovered by William Henry Finlay from South Africa on September 26, 1886, the comet circles the Sun every 6.5 years. This time around it reached perihelion on December 27th and spent many nights near the planet Mars low in the western sky. Until the new outburst, the comet had returned to its predicted brightness (~10 magnitude) and departed company with the Red Planet. It’s still low in the west, though not quite so much as in December, in the constellation Aquarius. With an orbit inclined only 6.8° to the ecliptic or plane of the Solar System, you’ll find it chugging eastward across the zodiac at the rate of 1° per night. The best time to view the comet is at the end of evening twilight at nightfall when it’s highest — 20° to 25° above the southwestern horizon. Right now it’s not far from Lambda Aquarii and will soon glide just south of the well-known asterism called the “Circlet” in Pisces. Currently between 7th and 8th magnitude and showing a bright, condensed center, Comet Finlay is easily visible in 10×50 binoculars. Catch it while you can. These outbursts often fade fairly quickly. While we don’t know its exact cause, what likely happened is that a new fissure opened up on the comet’s surface, exposing fresh ice to sunlight. Rapid vaporization of the new material may be behind the eruption. While Comet Q2 Lovejoy’s been getting all the attention, Finlay’s back in the game and making mid-January nights all that more enjoyable for sky gazing. 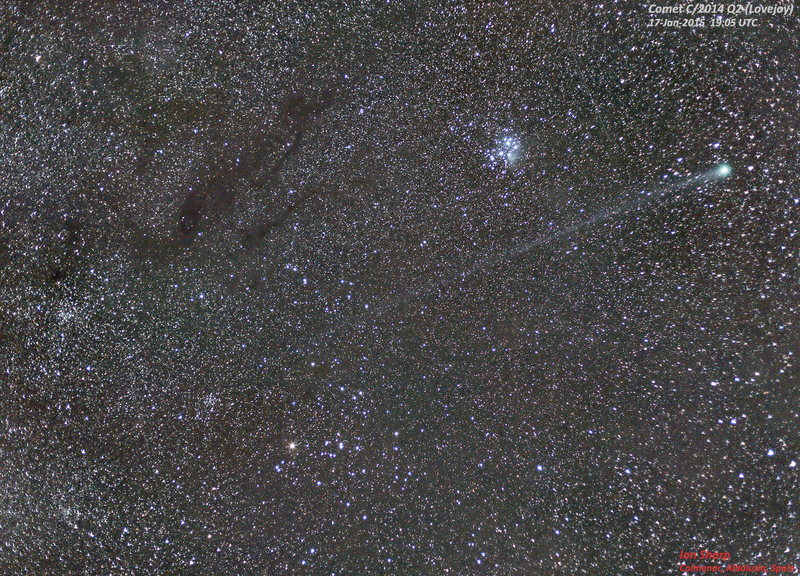 Lovejoy is presently passing near the Pleiades star cluster in Taurus. This coming week will be the last dark one before the Moon starts to spoil the view. I hope you’re able to spot both at the next opportunity. 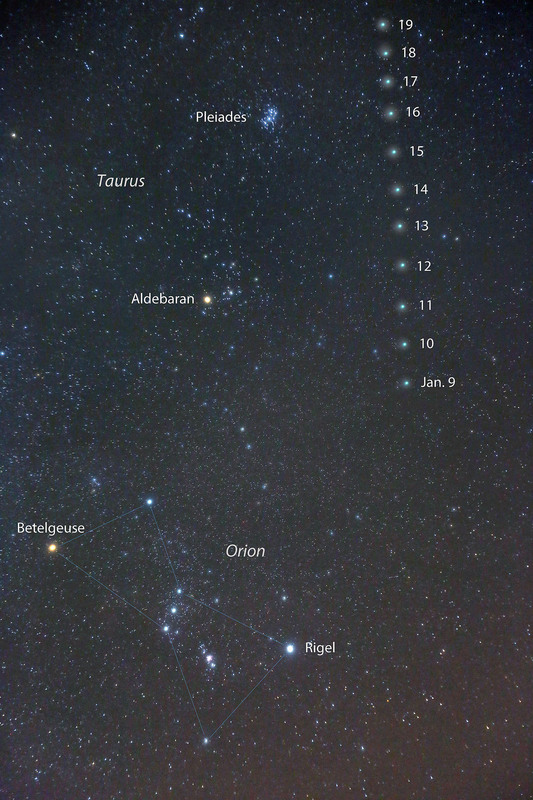 While we’re on the topic, take another look at the finder chart and you’ll see that Mars lies very near Neptune. The two are presently about 2° apart but on Monday Jan. 19th at dusk they’ll be separated by just 12 arc minutes or 1/5 of a degree and easily fit into the same medium-power view of a telescope. 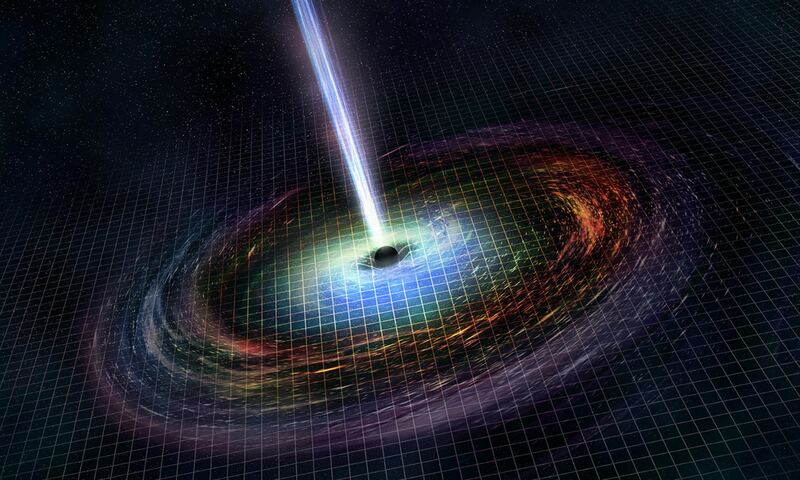 Pretty cool – and well worth seeing along with those comets! Oh my, oh my. Rolando Ligustri captured this scene last night as Comet Q2 Lovejoy swished past the globular cluster M79 in Lepus. If you’ve seen the movie Wild or read the book, you’ll be familiar with the phrase “put yourself in the way of beauty”, a maxim for living life adopted by one of its characters. When I opened up my e-mail today and saw Rolando’s photo, I felt like the beauty truck ran right over me. More beautiful images arrived later including this one by Chris Schur of Arizona. Even with the Moon at first quarter phase, the comet was plainly visible in binoculars last night shining at magnitude +5. I used 8x40s and had no problem seeing Lovejoy’s blobby glow. With a coma about 15-20 arc minutes in diameter or more than half the size of a the Full Moon, it really fills up the field of view when seen through a telescope at low to medium magnification. If you love the aqua blue hues of the Caribbean, Lovejoy will remind you it’s time to book another tropical vacation. In both my 15-inch (37-cm) and 10-inch (25-cm) reflectors, the coma glowed a delicious pale blue-green in contrast to the pearly white cluster. I encourage you to look for the comet in the next few nights before the Moon is full. Starting on January 6-7, the Moon begins its move out of the evening sky, giving observers with dark skies a chance to view Lovejoy with the naked eye. I’m looking forward to seeing its long, faint tail twist among the stars of Eridanus as the comet rapidly moves northward over the next week. 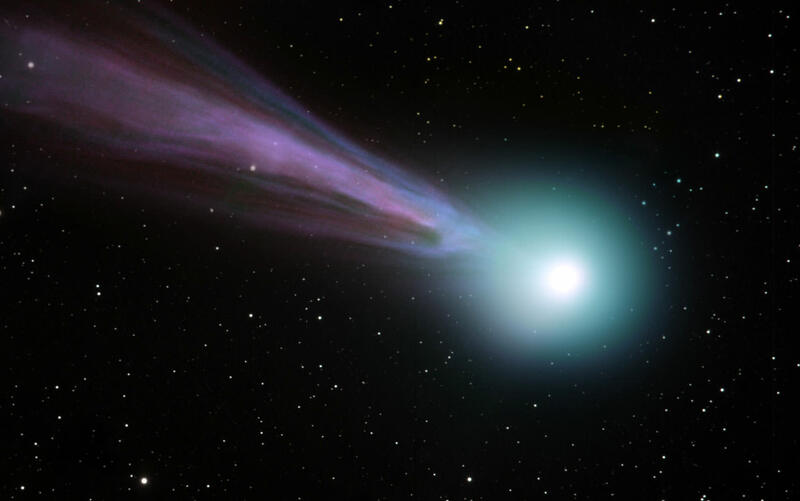 For a map on how to find the comet, check my recent article on Lovejoy’s many tails. Cheers to finding beauty the next clear night!